The 15 minute forum tonight was led by Andy Tharby, inspired by the above book. One of the principles behind this, is that we should be designing a curriculum and teaching sequence around what we know about memory – so that what they are taught, sticks. 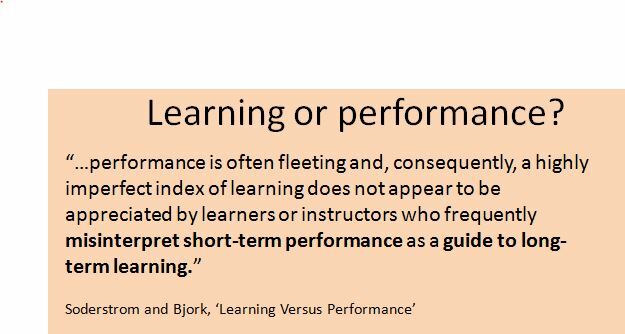 This links to an interesting point about what’s happening in lessons – learning or performance? The scene above is fairly common – and would be referred to as ‘good AfL’. The teacher has asked a question, the students write an answer (that they heard 3 minutes ago), the teacher pats him/herself on the back, congratulations the class on ‘learning it’ and they move on. The question is – would they be able to recall the answer in a week or two or three? Probably not. So have they learnt it? Almost certainly not. So is it safe to move on from that topic and not return to it for a year or so? Definitely not! So how students perform in a lesson does not mean learning – learning is far more complex. So, consider the two teachers above. Who’s the most effective teacher? As our thinking has moved on, it would be good to think that most people would agree that it’s teacher 2. The teacher who focuses on embedding knowledge – the teacher who knows when and how to move students from surface learning (knowing facts) to deep learning (using this knowledge for analysis and synthesis). Daniel Willingham, Why Don’t Students Like School? 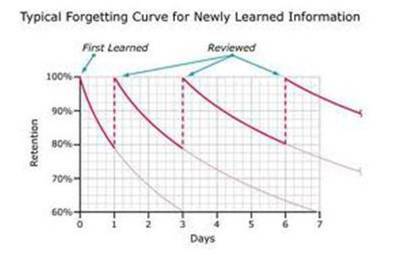 The graph above – The ‘Forgetting Curve’ stems from the work of a 19th Century German psychologist called Herman Ebbinghaus. He did experiments – on himself – on human memory. He taught himself made up, nonsensical words and then tested himself over time to see how long he could remember them for. As can be seen, and not surprisingly, over time the retention of the words went down – until the words were reviewed. Then the retention increased. What’s interesting is that with regular review, the ‘forgetting time’ gets longer – so going back over the words made it easier to remember them. The implications of this? If we want students to be able to remember things, we need to keep returning to them and reviewing them. What we tend to do though is learn a topic, then move on to another, then another etc etc. Thus making being able to recall the knowledge difficult. So what could we do to address this? Study information more than once. Regular low-stakes quizzing (retrieval practice), leaving greater gaps as you go. The scores for these tests are not important. What’s important is the act or retrieval – that’s what seems to have an impact on retention. Continue to return to important content. Retrieval is best when it’s effortful, when some forgetting has set in. A previous post from a great science teacher Pam McCulloch reinforces this. Pam got consistently fantastic results over a number of years. When questioned about how, she mentioned two things that resonate with the idea of spaced retrieval practice. Every lesson would start with a quick quiz on what they did last lesson, last week and last month. Similarly, homeworks weren’t just based on what they did that lesson, but again on what they did last week, last month or last term. She didn’t refer to it as spaced retrieval though – she called it ‘going back over stuff’! The image above (courtesy of David Didau) describes this. The curriculum is usually delivered in blocks – so one topic follows another, then another etc. So there is very little opportunity for returning to content and reviewing it – so making retention difficult as there are few opportunities for students to have to retrieve the information. having shown that they can do it once, they move on to a new topic. Often not returning to that topic for a year or so – not an ideal situation for retention. 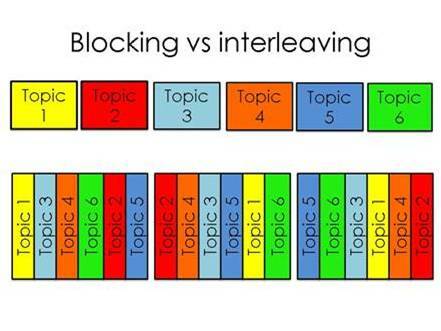 This could be addressed by interleaving the topics and returning to them at spaced intervals throughout the year. This requires a shift in thinking and will feel odd for a number of subjects e.g. in English, doing a bit of one text, then going onto another, then another, then returning to another etc. So another approach to this, could be to interleave common skills throughout the curriculum, as illustrated in the diagram above. A study on interleaving at an Art school showed it’s positive effects. It showed that people that were better at identifying a painter’s works if the works studied were interleaved rather than massed. 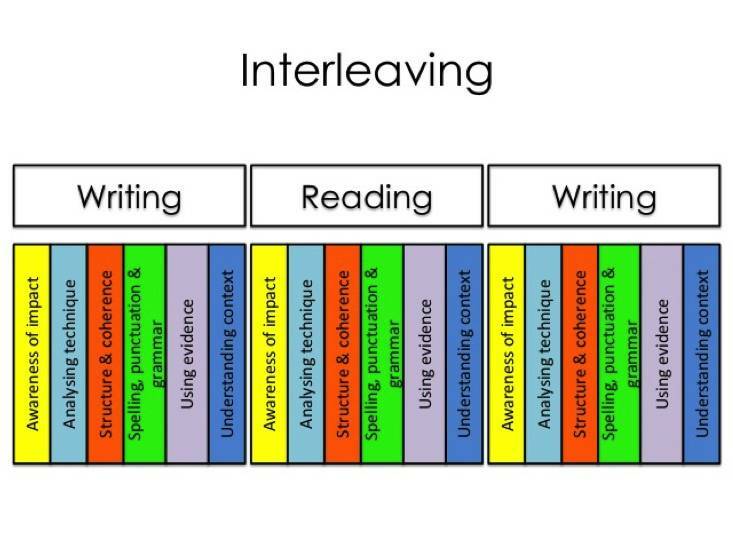 So, some thoughts on interleaving…. Scatter common problem types throughout your teaching. However, learners and teachers do not feel like it is working. Even after taking part in studies, many say that they prefer massed practice. WARNING. Handle research findings with a degree of caution! Working out what is important (threshold concepts) and working back from there. Assessing the same key skills/knowledge again and again but in slightly different contexts. This entry was posted in 15 Minute Forums and tagged Cognitive science, interleaving, Spacing. Bookmark the permalink. Excellent work again – and really in line with what’s troubling me at the moment; how do we get the balance right between interleaving and time for mastery? One of the problems, in my opinion, of some primary teaching has been the reliance on the spiral approach. It can lead to the “if they don’t get it this time, it’ll come up again next time” approach which leads some floundering time and again. If the learning isn’t secured the first time, then the re-visit simply becomes a repeat rather than building on things. It’s a difficult balance to strike. This is a great post covering several important issues for teachers. However, one point troubles me and I’ve taken this up before when this idea about performance, learning, and AfL has been raised. I completely agree that if you introduce a class to Newton’s 1st Law and then ask them to write it down on a MWB later in the lesson, it doesn’t show any learning. 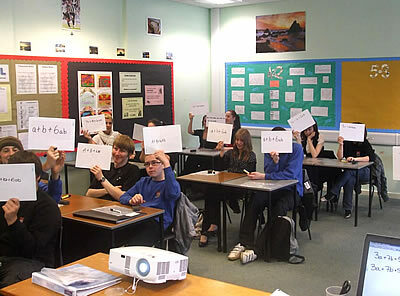 However, if you have a lesson that introduces the law, and then have activities to gradually deepen understanding, and then ask a hinge question that is only likely to be answered correctly by children who have understood how to apply the law, then that’s learning – not necessarily evidence that they will be able to do the same thing three weeks later but very useful feedback on who has understood and who still has misconceptions. In the picture, it’s not possible to dismiss a+b+6ab as meaningless unless you know what the question was, and what the gap is between what the children have been shown earlier, and what is being required of them now. That doesn’t in any way invalidate the argument that it’s necessary to re-visit, practice recall, and interleave, just don’t dismiss this AfL technique as it is useful for identifying misconceptions and spotting those who cannot yet perform. After all, you do have to be able to perform in the short-term before there is any hope of learning in the long-term, don’t you? Thanks for your comment. The intention was not really to denigrate AFL or to suggest that checking progress within lessons was not a valuable part of the process of teaching. 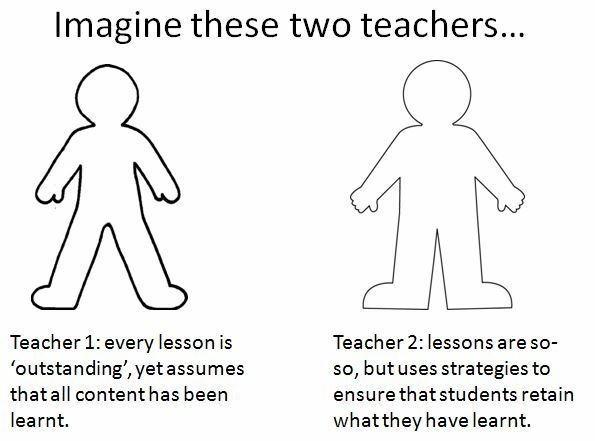 However, the point was that we must be careful not to jump to the assumption that, despite how well students might have ‘got it’ in the hear-and-now of the lesson, the learning will be retained, and perhaps more-importantly, applied accurately to new situations in the future. Here’s a reminder of something we shared with you in a Teachmeet…. Loved this book! This is what has inspired me to take on the Spiralled approach to teaching this semester. You’ve summarized it very well! Thanks for sharing your take! Really interesting article. 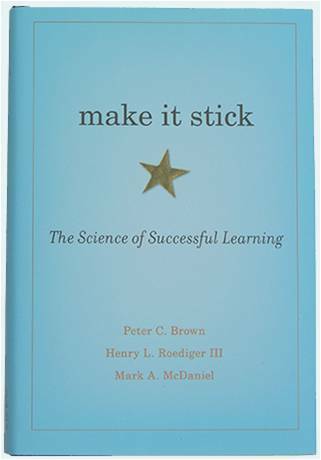 Will definately review my schemes of learning as a result of reading it! I have just 1 question – what do you mean by ‘practice, practice practice’ regime? I have observed that in the world of today, video games include the latest fad with children of all ages. Many times it may be extremely hard to drag the kids away from the video games. If you want the very best of both worlds, there are several educational activities for kids. Great post.